These amazing cross drop earrings are the perfect to compliment a bold lip. 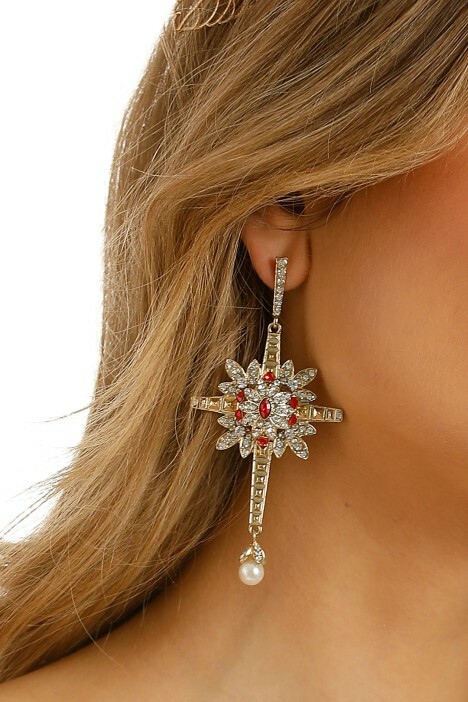 This heavenly star-crossed feature details dainty red and glass diamantes offering a regal addition that’s perfect to adorn for an upcoming ball event or cocktail evening. Go for printed maxi dresses and bright reds to enhance the romantic edge of these accessories. Hire a floral crown fascinator to match. Read our blog on how to wear fascinators for more tips and tricks!